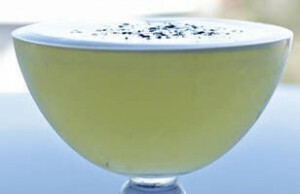 This ‘pineapple gimlet’ recipe is one of the top 12 in the World Round Qualifier this year. Round Qualifier is a stage of the World Class competition, the world’s pre-eminent bartending competition with leading bartenders from 50 countries vying for the title of ‘World Class Bartender of the Year’. Shake all ingredients, strain into coupette, and top with 3 grinds of Black Pepper.